The entire collection of over 15,000 pictures in over 80 categories plus the program that allows you to easily view or print the images are all on this one Flash! Pro3 USB. With a simple mouse click, you can choose the size of the pictures from 1, 2, 4, 6 or 8 to a page. Runs on all versions of Windows including XP, Vista and Windows 7 & 8. Below are a few picture samples reduced in size. a handful of action pictures. Occupations: Over 140 pictures of occupations and tools of trade. Associations: What goes with this eg. hand goes with glove (over 300 pictures). Animals: Over 900 pictures of birds, insects, mammals, reptiles, fish and sea creatures. Body Parts: Over 200 images in this section teaching the human anatomy with several photos of each body part. Food: Over 750 photos in this category of cakes, fruits, vegetables, sweets, drinks, dairy produce, meat and more. Nature: Images of rivers, lakes, ponds, fire, mountains, sunsets, moon eclipses, clouds, seashells, rocks, lightning. fire trucks, motorbikes, tractors, trains, trams and watercraft. with the moment we leave home. What's wrong with this: Images with deliberate errors to challenge the child's understanding of the real world. What's missing: Images with missing parts. Action imitation: "Do this" action images with various levels of difficulty. Clothing: Over 350 pictures of footwear, headgear, shirts, jackets, gloves, underwear etc. Toys: Over 500 images of toys. Computer items: Images to teach a child various computer items. Health & Safety: Dangerous items, medicines, safety items. Community objects: Images to various items in the community. Fractions: Images to teach quarters, halves, fifths etc. Multiple Discrimination: To teach the observation of small differences in similar images. Not: Images to teach the "Not" meaning such as the boy is sitting and the boy is not sitting. Safe and Unsafe: Images to teach the meaning of safe and dangerous items and situations. Remember, Flash! Pro3 has the largest collection of teaching images on a single USB. 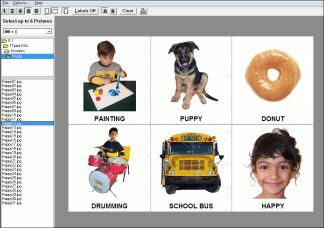 Plus you can use it to view, resize and print your own digital camera images as flashcards. Order now and get FREE delivery worldwide.